Every 6 months, Work Club, a London based ad agency, invites an up and coming artist to decorate its 22m long blackboard wall. 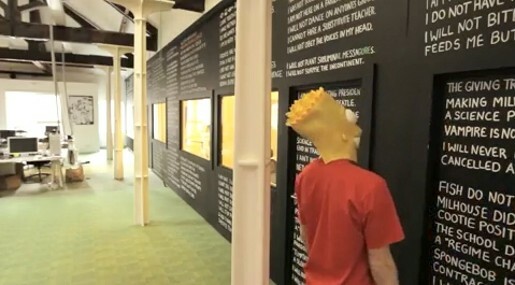 This time Bart Simpson was invited to come over on his skateboard and take over the office with every single line he’s ever written on the Springfield Elementary School blackboard. In order! Check it out at www.work-club.com/blackboard where you can zoom into each and every line. The Blackboard concept was developed at Work Club by Mathieu Cuvalier, Matt Robinson, Tom Wrigglesworth. Masked illustrator Matt Williams took two days, 20 white markers, 288 lines and 7697 characters to complete his lines. Filming was shot by director James Haworth at Hungry Man and edited by Mark Wheelan.